Anthony Kaldellis has authored an informative and accessible book about a dynamic period in Byzantine history that will appeal to general enthusiasts. The author's critical perspective sheds added light on a volatile and often overlooked epoch. When Basil II died in 1025 CE, the empire he left behind stretched from Sicily to the Crimea. His long reign was the pinnacle of one and a half centuries of Byzantine resurgence. Yet, within a lifetime, that same empire teetered on the brink of collapse. How could a state veer from one extreme to another so quickly? Anthony Kaldellis, a professor of Byzantine studies, seeks to answer that vexing question in Streams of Gold, Rivers of Blood: The Rise and Fall of Byzantium, 955 AD to the First Crusade. A brief prologue introduces the reader to the dynasty of Basil I (r. 867-886 CE), Byzantine state and society, and the geopolitical dynamics of the era. Part 1 opens with the death of Romanos I (r. 920-944 CE), nearly a decade before the subtitle’s starting point of 955 CE. Part 2 spans from 1026 to 1059 CE, the twilight years of Basil I's dynasty, and Part 3 covers 1059 to 1081 CE, a period in which the empire suffered catastrophic loss and neared demise. While he uses familiar sources, including the accounts of Michael Psellos, Kaldellis analyzes those often-conflicting accounts, integrating them with contemporary outside chronicles to assemble a more cogent narrative. This multi-faceted approach shines when the author details regional potentates, including Sayf ad-Din of Aleppo, Robert Guiscard of Apulia, and Alp Arslan of the Turks. Those details include the nature of their governments, strategic advantages and weaknesses, and their relationships with other states. Ultimately, Kaldellis offers two important conclusions on how and why the Empire went from apex to nadir in the 11th century CE: cannibalistic politics and dynamic external enemies. This first conclusion aligns with general assessments on the period. Where Kaldellis differentiates is in his defense of Constantine IX (r. 1042-55 CE). Likewise, Kaldellis defends the doomed reign of Romanos IV (r. 1068-71 CE). Kaldellis offers two important conclusions on how & why the Empire went from apex to nadir in the 11th century CE: cannibalistic politics & dynamic external enemies. The second conclusion, however, leads to Kaldellis’ weakest segment of the book. The epilogue examines roughly the first half of Alexios I Komnenos’s reign, from 1081 to 1099 CE. Where Kaldellis’s earlier chapters have a smooth and methodical flow, his epilogue covers 18 years at a brisk, almost frantic pace. Kaldellis’ main argument here is that the expedition, now remembered as the First Crusade, had been a smooth-running operation for Greek and Crusader alike. That is until 1098 CE when Alexios failed to relieve besieged crusaders at Antioch. Sources differ as to why the emperor did not rescue these men, though Kaldellis seems to go with an account of a message to the emperor that the garrison was already lost. In addition to the narrative, the book contains maps of the region, imperial genealogies, a glossary highlighting 10 key historical sources, a bibliography, and an index of persons and places. Anthony Kaldellis has produced a good balance of analysis and narrative that will appeal to general enthusiasts. 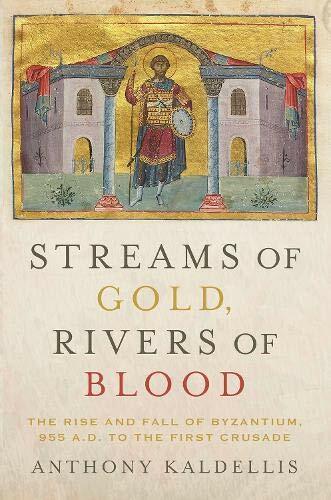 Rivers of Blood, Streams of Gold is a very informative, yet accessible look at an instrumental time in Byzantine history. His critical perspective sheds added light on this momentous period. Andrew Montiveo is a writer based in Los Angeles. He has contributed articles on the arts for The Worcester Journal, Foreign Politics Magazine, and Yahoo! Kaldellis, Anthony. "Streams of Gold, Rivers of Blood: The Rise and Fall of Byzantium, 955 A.D. to the First Crusade (Onassis Series in Hellenic Culture)." Ancient History Encyclopedia. Last modified July 02, 2018. https://www.ancient.eu/review/191/. Kaldellis, Anthony. "Streams of Gold, Rivers of Blood: The Rise and Fall of Byzantium, 955 A.D. to the First Crusade (Onassis Series in Hellenic Culture)." Ancient History Encyclopedia. Ancient History Encyclopedia, 02 Jul 2018. Web. 19 Apr 2019.